MDC-T has once again showed its propensity for violence after party leader and MDC Alliance presidential candidate Mr Nelson Chamisa threatened to unleash violence if it loses the forthcoming harmonised elections. 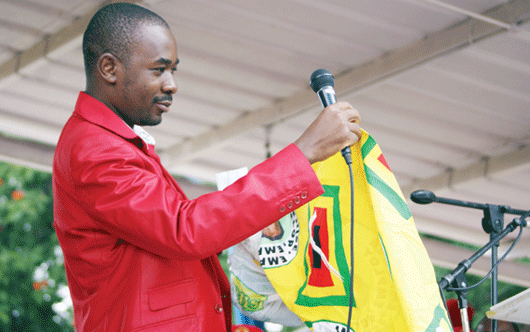 Mr Chamisa, who was addressing his party supporters at Jerera Growth point in Zaka, on Saturday promised that his party would use violent means to grab political power if they lose the polls. "This time around the election is going to produce one outcome and that is victory for the MDC Alliance," he said. "ZEC is a biased referee, a referee who throws away the whistle and joins the other team, we will protest against that, we are going to bring into the streets guys from Mbare Musika they are ready for that." "We are not going to leave any stone unturned. "In fact, we have given them enough time. This election is going to be very different because I am even ready to take power either by votes or by other means," he said. The threats by Mr Chamisa sharply contrasts with repeated messages for peace by President Mnangagwa, who has been incessantly calling for violence-free elections. President Mnangagwa has been exhorting Zimbabweans to observe peace before, during and after the polls for the outcome to be credible. However, addressing his party supporters at Jerera, the youthful Mr Chamisa also accused the Zimbabwe Electoral Commission of being biased. The MDC-T leader claimed that he was not kind-hearted like his predecessor, the late Mr Morgan Tsvangirai, threatening to lead street protests if electoral reforms were not implemented before this year's elections. Mr Chamisa threatened to mobilise unemployed youths from Mbare Musika to take part in the street protests. He claimed that the late Mr Tsvangirai feared Zanu-PF, saying it was the reason why the ruling party managed to remain in power. "We are in this situation because of fear. If it was in South Africa, things will not be like this. "Zimbabwe is cursed and the day we are going to shed our fear is the very day we are going to be liberated," said the MDC-T leader. "We will tell the people that in order to unlock the jam in the country, action needs to be taken, this struggle requires people who are speedy like us, yes there are other cool heads in the movement like Vice President Mr Elias Mudzuri, yes some will increase speed while others will reduce speed in the movement, we can't be the same," he said. The MDC-T has always threatened to unleash violence despite its pretensions to be a democratic party driven by the pursuit of democratic norms and values. Zanu-PF has been walloping the opposition party in successive elections since its formation in 1999. Last year, opposition parties under the National Electoral Reform Agenda (NERA), held nationwide protests that turned violent resulting in the arrest of some opposition activists. Mr Chamisa also held a rally at Nyika Growth point in Bikita, before going to Zaka as part of his MDC Alliance's campaign to drum up support ahead of this year's polls.